Witnessed as one among the potential chemopreventive agent, Grape seed and its extracts are effective natural medications to support cancer treatment in all the three stages of carcinogenesis, including initiation, promotion and progression. As the most trusted carrier oil in aromatherapy, Grapeseed oil is often preferred as excellent massage oil for its light consistency and easy absorbent efficiency. It is often recommended for treating wrinkles, rheumatoid arthritis, diabetes, cancer, hemorrhoids, stretch marks and high blood pressure. Ayurveda honors Grapes as ‘Drakshaa Phalottamaa,’ which means that Grapes is the best among all other fruits. Numerous Ayurvedic medications contain Grape and its other extracts in the treatment of urinary tract infections, tuberculosis, bloating, diarrhea, hypertension, obesity, gastritis, jaundice, depression, fatigue, anorexia, infertility, memory loss and indigestion. The major chemical constituents of Grape seed oil are alpha-linoleic acid, palmitic acid, oleic acid, stearic acid, palmitoleic acid, linoleic acid, phenols (tocopherols), steroids including stigmasterol, campesterol, beta-sitosterol, flavonoids and oligomeric proanthocyanidin complexes (OPCs – source of rich antioxidants). The promising therapeutic properties of Grape seed oil are antioxidant, moisturizing, emollient, anticancer, cicatrisant, diuretic, cardio-tonic, anti-inflammatory, adaptogenic, anti-allergic, anti-histamine, anti-dandruff, immune stimulant, antimicrobial and anti-aging. It also contains Vitamin E, which is extremely beneficial for skin and hair. Vitis vinifera is the scientific name of grapes. The Greeks were the first among the world populace to consume grapes for its varied health benefits. Grapes were found to relish the universe for more than 6,000 years. The juice extracted from Grapes has been mentioned in the Bible and the Old Testament denotes that Prophet Daniel promoted the uses of Grape seed oil by using it in a culinary variety called as Pulse. Indigenous to Asia, Grapes were later taken to Europe and North America. Many Greek philosophers wrote about various health benefits of Grapes in their medical writings. The traditional European medical practitioners used sap of grapevines in making an ointment for treating eye problems and skin disorders. Dried grapes or raisins are one among those best natural medications for treating constipation, liver problems and excessive thirst. Ayurveda and certain other Complementary and alternative medicinal practices recommend grapes and its extracts in the treatment of cholera, cancer, sore throat, nausea, infections of the eye, small pox, heart conditions and skin problems. The Ayurvedic text ‘Dhanvantari Nighantu’ indicates grapes as one among the Swadu Triphala along with dates and Kashmari fruit and with dates and pomegranate. Grapes are also classified as highly nutritious food, Santarpana foods. Grapes and its various other natural extracts, including grape seed and its oil has been under the limelight of scientific research later, where various therapeutic values including the antioxidant and chemopreventive effects of Grape seed extracts have been proved with corresponding evidence. Grapes can never be neglected in any of our fruit list or nutritious diet curriculum. With all the other gifts of Mother Nature, Grapes are indeed a blessing on mankind with a bunch of remedial properties, just like the bunch of grapes on the grapevine. ‘The Fox and the Grapes’ story is still fresh in my mind and I remember the sight of grapes would influence our taste buds just like that in a jiffy. Ayurveda beckons grapes with various Sanskrit names and the most interesting names are here for your reference. For its extremely appealing looks, it is called as Charuphala and Priyala; Nutritious values –Bruhmani; Aphrodisiac properties – Vrushya. Acharya Charaka, the most renowned Ayurvedic philosopher and the creator of Charaka Samhita, the ground-breaking Ayurvedic encyclopedia has classified grapes as Kanthya, meaning herbs that help in soothing throat and enhancing voice; Shramahara, which means herbs that alleviate fatigue and drowsiness; Kashara, meaning cough suppressant herbs. The 6,000 years history of Grapes is richer than the 5,000 years old Ayurvedic healing, which is more than a valid proof for the presence of Grapes and its various extracts in Ayurvedic medications. The philosophy of Ayurveda believes that everything on earth along with human beings is made up of the five fundamental elements called as Devanagari or Panchamaha boothas. These five elements, namely fire (metabolism, intellect, vision and body temperature), water (blood, salivary glands and digestive juices), air (respiration, cardiac, muscular and nervous functions), earth (bones, muscles, hair, skin and nails) and space (lungs, abdomen, thorax and mouth) join together to form the unique individual constitution or Prakriti of a person, which is a combination of 3 biological energies called as doshas. Doshas are a combination of five vital elements, kapha (earth + water), vata (space + air) and pitta (fire + water). The physique, emotional traits, spiritual connectedness and behavioral attributes of a person is based upon the predominant dosha. Absolute balance between doshas according to nature’s law indicates perfect health and unevenness leads to diseases. Ayurvedic treatment starts with the individual as a whole and not just as an attempt to treat their health conditions. Swasthya is the aim of Ayurvedic healing, which means a healthy state of the body, mind and spirit. For attaining longevity through hale and hearty lifestyle practices, impediment of diseases and understanding self, Ayurveda recommends herbal medicines, Ayurvedic essential oils, Dinacharya or Ayurvedic routine, yoga, simple physical exercises, Pranayama or mindful breathing, Panchakarma or cleansing technique, prayers, and meditation. Grape seed oil has been recommended in Ayurveda for pacifying kapha and vata and for enhancing pitta dosha. Grape seed oil is a light and easily absorbing oil with many benefits for the skin and hair with the presence of linoleic acid, the most banked upon essential fatty acid for boosting the health of skin cells (Twachya) and hair follicles (Keshya). With its mild astringent, antioxidant and anti-aging qualities, Grape seed oil supports in fighting against free radicals that contribute to aging symptoms like wrinkles, fine lines, blemishes and saggy skin. It protects the skin from sun damages. Massaging your skin with 5 drops of Grape seed oil blended with 1 drop of Bergamot oil and 1 drop of Lavender oil can help in toning and tightening the skin cells. Being emollient and regenerative oil, it assists in moisturizing the skin surface and nourishing the skin cells from within. A 2002 study on “Dermal wound healing properties of redox-active grape seed proanthocyanidins” by The Ohio State University Medical Center and Creighton University Medical Center witnessed the effectiveness of Grapeseed extracts in healing dermal wounds quickly. It concludes stating, “Topical application of Grape Seed Proanthocyanidins Extracts represents a feasible and productive approach to support dermal wound healing.” This contributes to the cicatrisant or wound healing properties of Grape seed oil. The presence of Vitamin E makes it a vital ingredient in moisturizing creams, lip balms, sunscreen lotions, shampoos, conditioners and few other ranges of cosmetics. The most interesting fact is that Grapeseed oil has double the times of vitamin E in Olive oil. Gently massaging your scalp with 10 drops of Grape seed oil with 2 drops of Lime oil can help in treating dry scalp conditions, itchy and flaky scalp, dandruff, hair loss and frizzy hair. This oil spreads evenly and dampens the dry conditions of your hair, leaving it soft, smooth and silky. Grape seed is a potent antioxidant with the presence of oligomeric proanthocyanidin complexes (OPCs), which can prevent cellular tissue damage by the invasion of free radicals and resveratrol, a natural phenol that protects the cells from the attack of pathogens. A 2009 study on ‘Anticancer and Cancer Chemopreventive Potential of Grape Seed Extract and Other Grape-Based Products, published in the Journal of Nutrition and in PubMed,’ proves the efficacy and mechanisms of action on various epithelial cancer models. Melanoma or skin cancer is often caused by the adverse effects of ultra violet radiation on human skin. The presence of proanthocyanidins in Grape seed is an excellent source for preventing and fighting against the development of skin cancer. 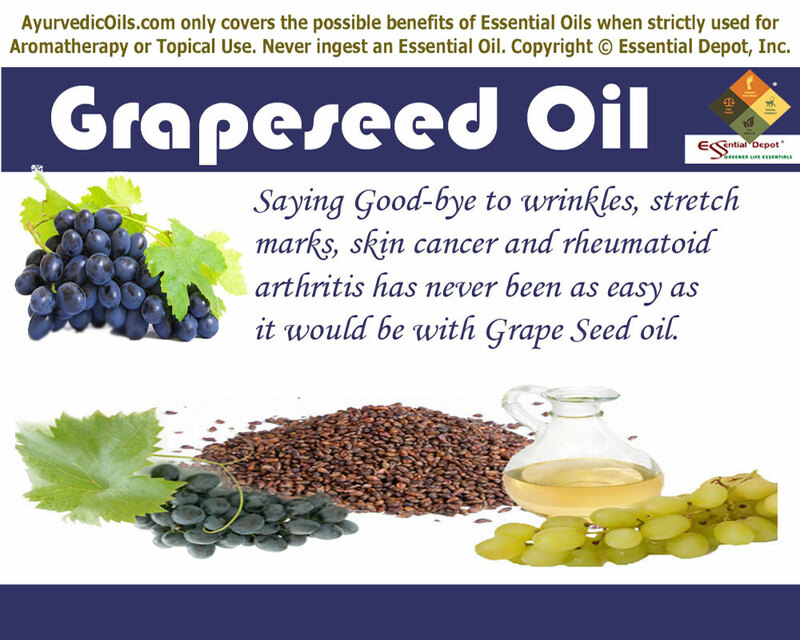 Grape seed oil has anti-inflammatory, antioxidant, circulatory and diuretic properties that help in promoting normal blood circulation, arrest the growth of free radicals, reduce swelling or inflammation, soothe inflamed nerves and discard toxic remains and water retention in the system through urine, sweat and faeces (for which it is called as Mutrala and Malakrut in Ayurveda). The presence of oligomeric proanthocyanidin complexes (OPCs), flavonoids and other vital nutrients in Grape seed oil does all these magic and makes it a promising natural aid in treating rheumatism, arthritis, varicose veins, chronic venous insufficiency, edema and stiff muscles. Massaging the affected parts with 10 drops of Grapeseed oil with 2 drops of Petitgrain oil can help in fortifying and repairing broken capillaries and blood vessels, enhancing blood circulation in case of spider veins, hemorrhoids and varicose veins, reducing swelling and inflammation in rheumatoid arthritis, supporting recovery from an injury and post-surgery conditions. The University of Maryland Medical Center quotes studies where patients who used Grapeseed extract after breast cancer surgery and sports injury had less edema and swelling than others who used placebo. Strengthening cognitive power and the functions of the brain is another adorable attribute of Grape seed oil and is one among those brain tonic or Medhya herbs in Ayurveda. “It lowered blood glucose, lipid peroxidation, hydrogen peroxide level, and increased protein sulphydryl (P-SH) content in the hippocampus and significantly improved cognitive performance,” witnesses this analysis. Using 3 ounce of Grape seed oil with 7 drops of Rosemary oil and 3 drops of Ashwagandha oil in a massage blend, can support effectively in enhancing the functions of hippocampus, part of the brain and is the center of memory, emotions and the autonomic nervous system. This is how Grape seed oil aids in improving cognitive abilities, elevating memory power and in treating Alzheimer’s disease and memory loss. Grape seed oil acts like a cardiac tonic that reinforces the functions of the cardiovascular system by reducing the level of LDL (low density lipoproteins) or bad cholesterol and augmenting the level of HDL (high density lipoproteins) or good cholesterol. As a natural aid with mild blood-thinning properties, Grape seed oil can be of great help in removing blocks or clots in the blood vessels and treating coronary diseases. It supports the functions of the heart and is called as Hrudaya in Ayurvedic healing. Grape seeds can support in controlling high blood pressure and other conditions associated with metabolic syndrome. A study with four weeks of Grape seed extracts proved it’s potent in reducing diastolic as well as systolic blood pressure. The rich presence of gamma-linoleic acid in Grape seed helps significantly in lowering cholesterol levels in the system. A study published in the International Journal of Food Science and Nutrition witnesses’ insulin resistance in obese or overweight females. Grapeseed oil and other extracts assist in the treatment of tooth decay, low night vision, diabetic retinopathy and diabetes. Stick to a healthy and wholesome diet. Simple physical exercises every day might sound simple but has immense benefits on your health regimen. Connecting with the Divine Force either through prayer or meditation for about 10 – 15 minutes a day can help in self-realization and immense self-belief. Chuck out about 70 per cent of toxins in your system daily by extended exhalation during Pranayama or the art of balanced breathing. Think positive and accomplish your duties for eternal satisfaction. Enrich your body with the habit of drinking ample water. Hmmm…. I’m done for the day and it’s your turn now…..
Use essential oils only for topical application as 100 per cent organic and pure oils are highly concentrated liquids and might cause allergic reactions, if taken internally. Do a patch test with Grape seed oil before using it on your skin. This article is only for the purpose of education and is not meant to diagnose, substitute any prescription medicines or the advice of your healthcare professional. We are not medical experts and this info is shared only on the basis of enlightening Ayurvedic healing, the pioneer of all medical sciences on earth. Consult your Ayurvedic expert or medical professional before choosing the appropriate oils for your unique individual constitution or Prakriti and state of health or Vikruti. Take special care before using Grapeseed oil on pregnant women or nursing mother or on children. If you truly love Nature, you’ll find beauty everywhere. The Comprehensive Guide to Skin Care: From Acne to Wrinkles, What to Do (And Not Do) to Stay Healthy and Look Your Best by Rebecca B. Campen M.D. 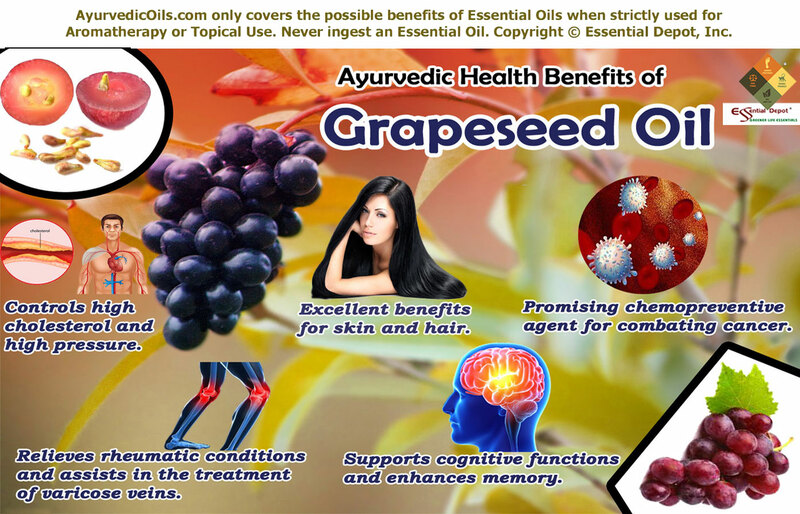 This entry was posted in Essential Oils - Learn About and Purchase and tagged Ayurvedic health benefits of Grape seed oil, Ayurvedic oils for acne, Ayurvedic oils for cancer treatment, Ayurvedic oils for frizzy hair, Ayurvedic oils for high blood pressure, Ayurvedic oils for memory power, Ayurvedic oils for rheumatoid arthritis, Ayurvedic oils for varicose veins, Best oils for hair care, Best oils for skin care, Chemical constituents of Grapeseed Oil, Grape seed extracts in Ayurveda, Grape seed oil and Ayurveda, Grape seed oil in Ayurveda, health benefits of Grape seed oil, Natural remedies for reducing cholesterol, Natural remedies for wrinkles, oligomeric proanthocyanidin complexes (OPCs), Therapeutic properties of Grape seed oil, Vitis vinifera by AyurvedicOils. Bookmark the permalink.